Adventure first appeared in November 1910. Quickly attracting top name authors, it soon became renowned for publishing the type of fiction its name implied. It grew into a powerhouse in the genre fiction field, and was later dubbed by Time magazine, the “No. 1 Pulp.” Paying top rates, at times published as frequently as thrice per month, a crack editorial staff published adventure fiction in all genres from the top authors of the day. Many of its stories were singled out for inclusion in “best story of the year” anthologies during its heyday. Now, with the advent of The Best of Adventure from Radio Archives, listeners will be able to thrill to these classic stories for the first time on audiobook! The Best of Adventure kicks off with “The Curved Sword” by Harold Lamb. Though he received his start writing for the pulps, Lamb was a medieval scholar whose later historical works were well received, starting with Genghis Khan: Emperor of All Men, published in 1926. He received a Guggenheim Fellowship in 1929 for Medieval History and his two volumes on the Crusades, published in 1930, led to his being presented with a medal from the Persian government for scientific research. They also opened the door to his later career as a Hollywood screenwriter, beginning with Cecil B. DeMille’s “The Crusades,” released in 1935. “The Curved Sword” is one of Lamb’s classic tales featuring his longest running series character, Khlit the Cossack, a descendant of the legendary Genghis Khan. Armed with his keen wits and curved sword, handed down to him by his forebears dating back to the Great Khan, Khlit—surnamed the Wolf—roamed throughout Central Asia in the late 16th and early 17th centuries, finding adventure and danger at every turn. Whether facing off against the Old Man of the Mountain—leader of the deadly Assassins—the Mongol hordes, Chinese warlords or any of a host of other foes, Khlit’s life often stood in the balance in 19 tales published in Adventure. “The Curved Sword” unites Khlit with another of Lamb’s series characters, the Afghan Abdul Dost. In service in the army of the Mogul, the warrior Dost is the hero of five of Lamb’s stories, as well as linking up with his boon companion Khlit for four more. Join us now for a tale of high adventure as Khlit and Abdul Dost match swords and wits with the armies of Jahangir, the Mogul, and his bride to be, Nur-Jahan, the Light of the World! This is Adventure at its best! Read by Milton Bagby. 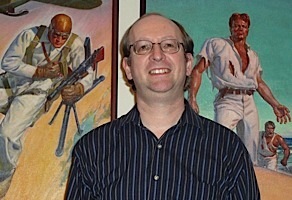 Doug Ellis has been a pulp collector and researcher for over 30 years, with over 15,000 pulps in his collection. He co-founded and co-organizes the Windy City Pulp and Paper Convention, held every year in the Chicago area. For many years his Tattered Pages Press published the acclaimed pulp fanzine Pulp Vault, as well as other books on the pulps. He was one of the authors of The Adventure House Guide to Pulps, and has edited several pulp anthologies, including the “Best of Adventure” and “Adventure Library” series from Black Dog Books. His book, Uncovered: The Hidden Art Of The Girlie Pulps, an in-depth study of the spicy pulps and their art, was named ForeWord Magazine’s 2003 Popular Culture Book of the Year. In 1996 he received the Lamont Award, for contributions to pulp fandom. The two photos on the wall are original Adventure covers by Hubert Rogers.